Flickr contributor meccanohig has a set of photos taken by an anonymous pipeline engineer working in Egypt in 2002. It features a lot of old Armstrong guns from the late 1860's through the 1870's. 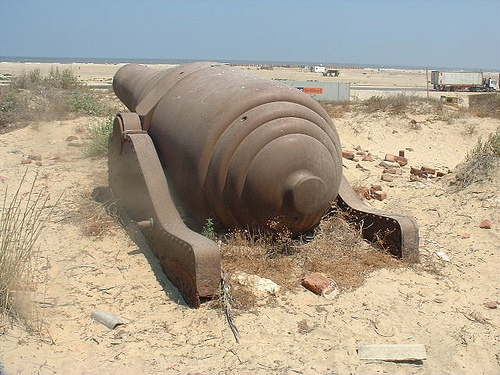 They are quietly rusting away in the desert, would be nice to take care of them as there aren't that many of them left. The British occupied Egypt in 1882 on the pretext of supporting the Khedive against the Nationalists, and weren't persuaded to leave until 1956. Meccanohig is a keen meccano modeller and collector and his photos of meccano sets and models are quite stunning.